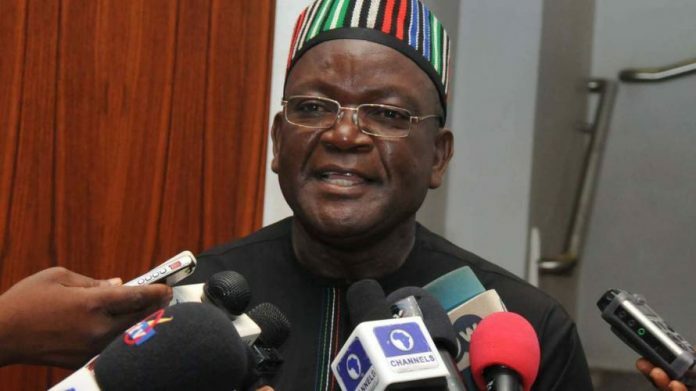 The Benue Governor, Samuel Ortom, has appealed to the Federal Government of Nigeria to rehabilitate its major roads in the state. He made the appeal today at the Benue Peoples House during a courtesy call on him by the Minister of State for Works, Transport and Energy, Surveyor Suleiman Hassan Zarma. He listed the Abinsi -Agasha -Anyiin -Wukari, Makurdi – Gboko-Katsina-Ala, Makurdi-Otukpo – Ninth-mile as well as Makurdi – Naka -Ankpa roads as those that needed urgent attention. The Governor said if rehabilitated, the roads will facilitate ease of doing business within Benue and beyond as well as facilitate security operations. Governor Ortom also canvassed the construction of two bridges at Buruku and Tyulen to ease transportation in the areas, adding that information at his disposal revealed that design of one of the bridges has been completed. While appreciating the renewed vigour with which the Federal Roads Maintenance Agency, FERMA was working on some roads in the state, he called for strict supervision of the projects in order to ensure quality execution. The Governor suggested that only competent contractors should be given jobs while those who do shoddy work be sanctioned in order to protect the integrity of government. He assured that all issues regarding compensation and additional land would be addressed in all phases of the ongoing housing project as well as the proposed federal mass housing estate for low income earners. Minister of State for Works, Transport and Energy, Surveyor Hassan Zarma said he was in the state to inspect ongoing projects under the purview of the ministry. He also appealed to the state government to wade into the illegal encroachment on the right of way of some of the roads and other roads in the state.